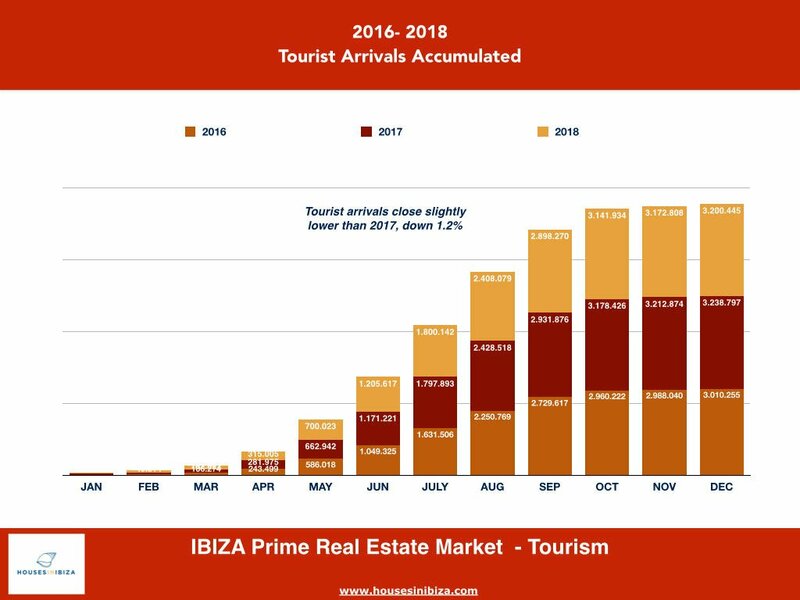 As a very mild and very sunny winter starts to make way for spring with the almond trees are in full bloom we look at the year gone by and the perspectives for the coming years, in terms of the Real Estate Market in Ibiza. I still think we are at a very interesting point for the island of Ibiza. This ever changing, magical place is shifting yet again. And I am very excited about what is happening! First of all, we have had less pressure on the island in peak season. The season in itself is consolidating into a longer, more even distribution of visitors. And importantly, we are finally seeing some of the the excesses of the previous seasons being corrected, eliminated or just readjusted through pricing. A couple more seasons of “cleansing” and claiming back the more authentic ¨spirit ¨of the island will provide a perfect springboard to the next phase for Ibiza. Consolidate our market, correct the excesses and reset the island. 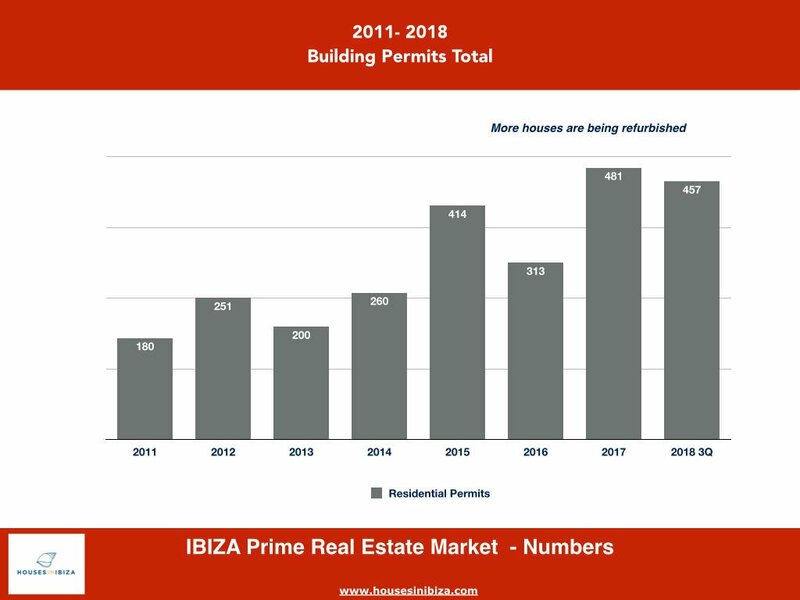 All good news for the Ibiza we all love going forward. 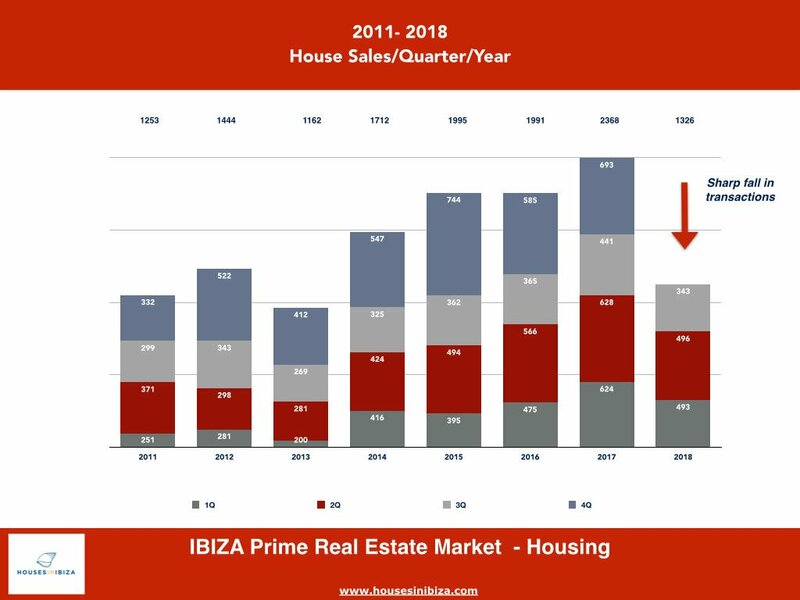 What does this mean in terms of the current Ibiza Proprty Market and pricing? Let’s look at the recent figures! 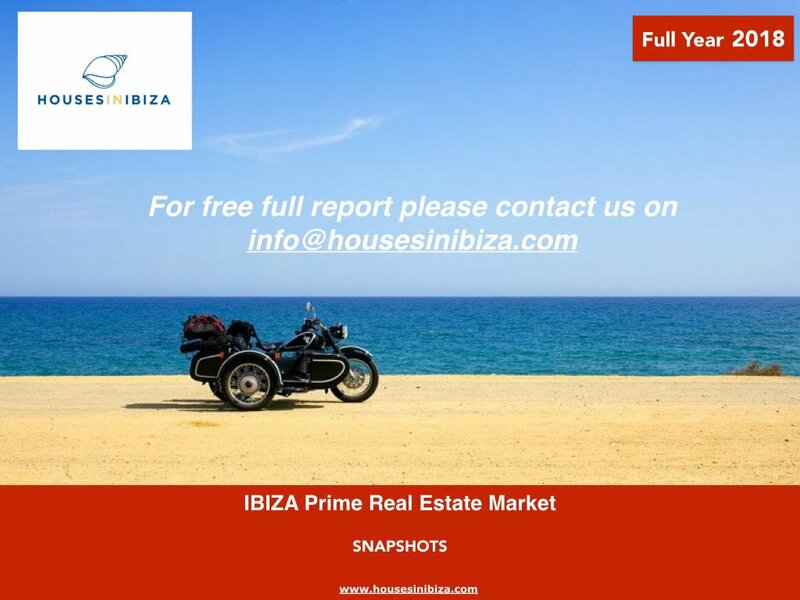 -More properties than ever on offer, listed offered properties have more doubled in 18 months! 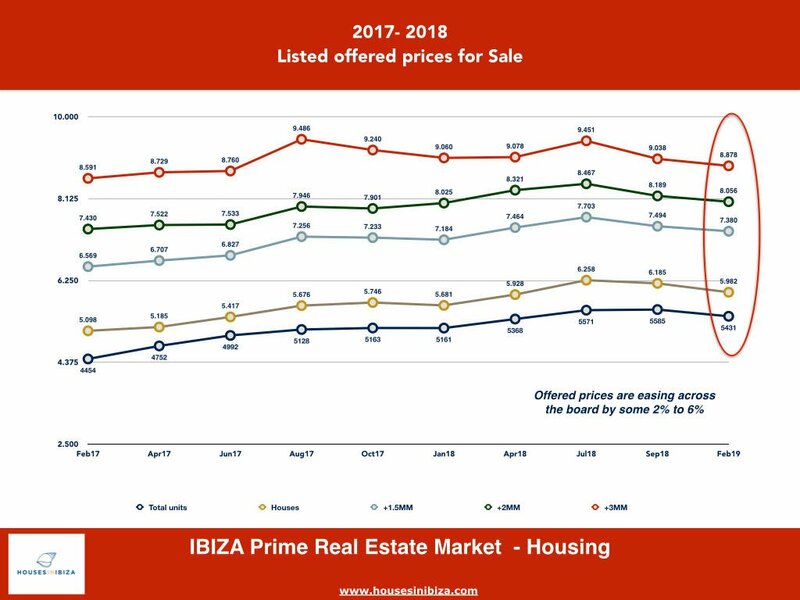 -Offered Listed Prices, are starting to come down across all the price spectrum, higher supply is putting pressure on offered prices, that are some 5% lower in a year. 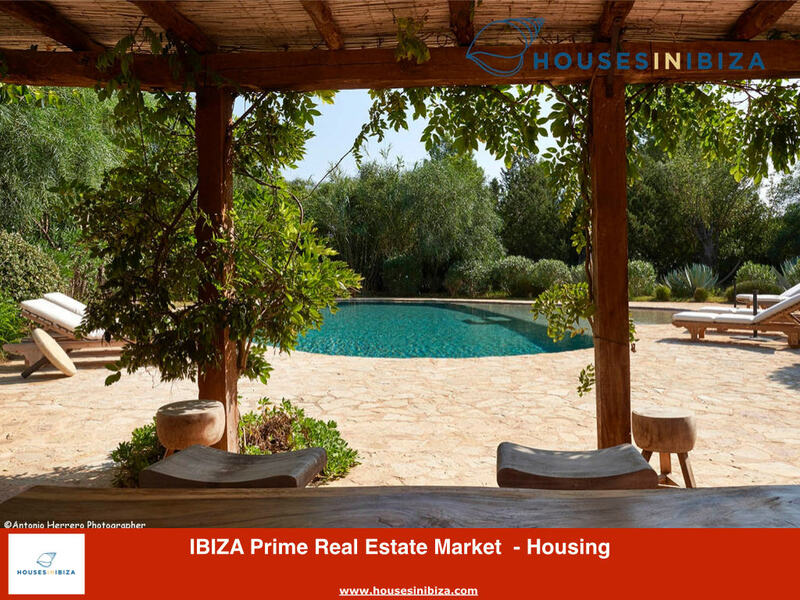 -Ibiza Home sales, after a very strong 2017, look much softer for 2018, recent numbers point to a more than 20% fall, meaning fewer transactions and a tighter market. -Fully legalised quality properties are scarce. Planning permissions remains lengthy, strict and tight. 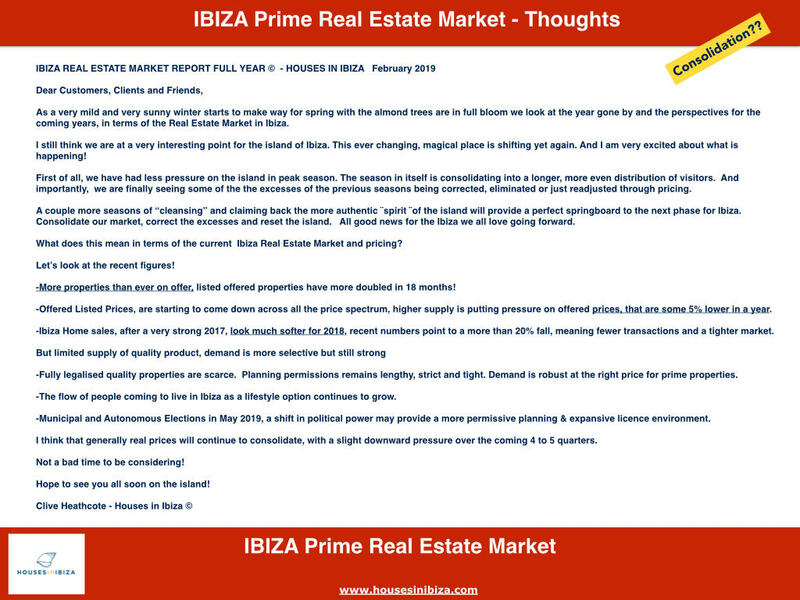 Demand is robust at the right price for prime properties. 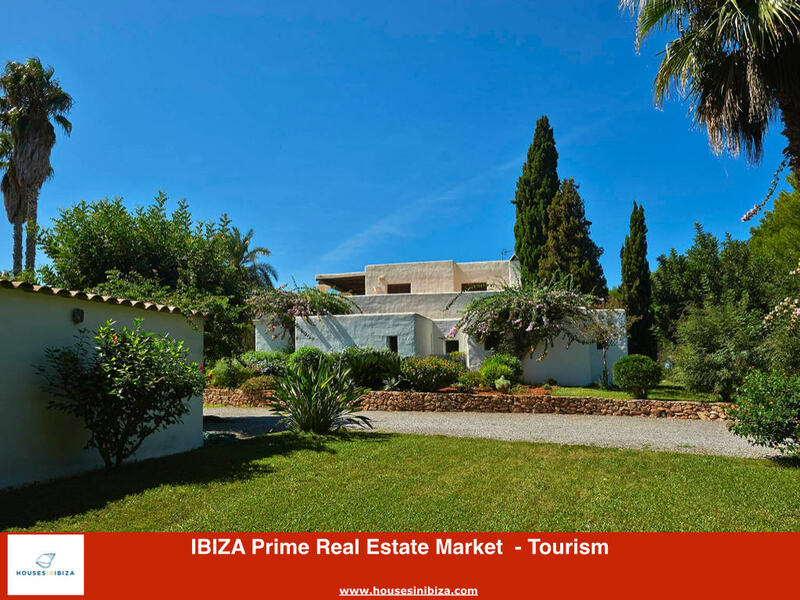 -The flow of people coming to live in Ibiza as a lifestyle option continues to grow. -Municipal and Autonomous Elections in May 2019, a shift in political power may provide a more permissive planning & expansive licence environment. I think that generally real prices will continue to consolidate, with a slight downward pressure over the coming 4 to 5 quarters.